The Victorian Planning Authority has been busy in many corners of the city and state but today we'll have a look at one precinct renewal project that is tucked away in Melbourne's outer south-east, the Berwick Health and Education precinct. 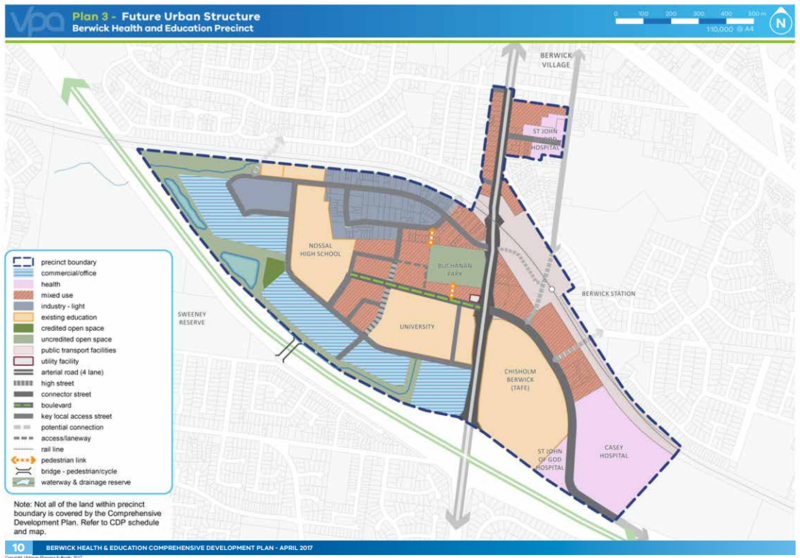 On land that used to host the Casey airfield, the planning work the Victorian Planning Authority has undertaken in consultation with stakeholders would see a longer-term transition for an entire precinct located to the south of Berwick station. Chisholm TAFE and Monash University for many years were the lead tenants in the area with their respective Berwick campuses inhabiting both sides of Clyde Road. Federation University now owns and operates the former Monash Campus. In 2010, the public selective-entry Nossal High School opened next to the University campus and in the previous decade, Casey Hospital opened on its site adjacent to the railway line. Since then, the local private hospital - St John of God - has opened a new campus opposite the publicly funded Casey Hospital. Using the local code - Amendment C207 to the Casey planning scheme - the work undertaken by the VPA and other stakeholders has been split in two parts. Part 1 covers the land you see in the map above. Part 2 includes a smaller parcel of land located north of the railway line and to the west of Clyde Road. Amendment C207 will include rezoning Part 1 land from various existing zones to Comprehensive Development Zone 2, insert a new incorporated document titled 'Berwick Health and Education Comprehensive Development Plan, April 2017' and amend a schedule to set a 5 per cent public open space contribution rate for non‐residential subdivision and retain a 10 per cent contribution for residential subdivision. The areas to the south of the railway line and west of Clyde Road has for multiple decades hosted light industrial employment and wholesale outlet uses and immediately adjacent to Berwick station, many automotive and fast food business inhabit the land. Over the long-term, as per the future urban structure, the land around Berwick station would transition to have commercial/trade uses at ground level with apartments above in buildings ranging from 4 to 6 stories. Land around the edges of the University campus and High School will be office/commercial in focus with minimum building heights set at 6 levels. New pedestrian connections across the Monash Freeway and railway corridor to the east of Berwick station are also on the cards. Part 1 on Amendment C207 has been finalised and was submitted for approval in September 2018. It is anticipated to accommodate up to 8,500 jobs, 11,300 students, 751 hospital beds and 1,025 high-density dwellings. For more information on the Berwick Health and Education precinct, see vpa.vic.gov.au.